This celebrated, essential handbook for the urban homesteading movement shows how to grow and preserve your own food, clean your house without toxins, raise chickens, gain energy independence, and more. Step-by-step projects, tips, and anecdotes will help get you started homesteading immediately. 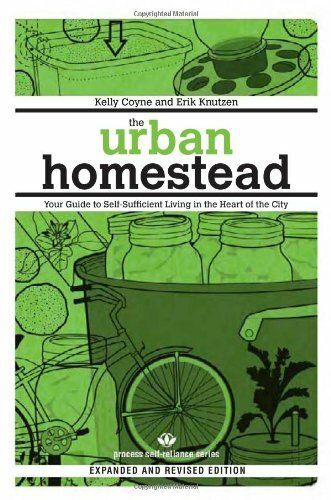 The Urban Homestead is also a guidebook to the larger movement and will point you to the best books and internet resources on self-sufficiency topics. Kelly Coyne and Erik Knutzen are creators of the blog Root Simple, a green living and self-sufficiency resource for urbanites. They live in Los Angeles. Check out the book’s Facebook page!